Despite the Minister of Interior′s claims that the police are forbidden to use live ammunition during the policing of the social protest , videos and photos of police wielding pistols and automatic weapons have flood social media sites. Videos show images similar to gang fighting – both sides, police and protesters, with their faces covered and both exchanging slingshots and missiles, the police of course favoured by their ready supply of live ammunition supplied by the state. One video shows a police officer, apparently taken by emotion or excitement of the fighting, take out his pistol and fire repeatedly in the direction of the protesting farmers . 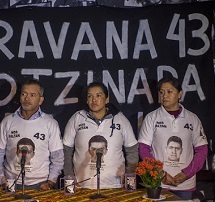 Since the indefinite strike began in April four men have lost their lives – three men, Victoriano Huayna Nina, Henry Checlla Chura and Ramón Colque died by police fire and one man, police officer Alberto Vásquez Durand, died as a result of violence from protesters. Various international human rights organizations have spoken out against the excessive use of force by the police. Amnesty International, as part of an Urgent Action addressed to President Ollanta Humala, states ′violence from some protesters should not be used to quell the right to peaceful assembly of the majority and authorities should ensure that those who are protesting peacefully are able to continue to do so′ . The AI Director of the Americas concluded that the price of social protest shouldn’t be the death of a single person . Likewise, the South American Regional Office of the UN High Commission on Human Rights condemned the deaths and the use of excessive force. The Office called on the Peruvian government to carry out a prompt, independent and exhaustive investigation that permits the identification of those responsible for the deaths . In addition to tactics of repression and brutality as a means of suppressing the protests, the language of terrorism has also been used to classify those who oppose the mining project. When the voice of Southern spoke of ‘anti-mining terrorism,’ as mentioned above, not a single Minister contradicted him. To the contrary, the concept was taken up and run with by some ultra-right elements within the government. For instance, congresswomen for the right-wing Popular Christian Party (PPC) Lourdes Alcorta called the ‘delinquents’ of the protest ‘enemies of the homeland’ . Fellow PPC congressman for Arequipa Juan Carlos Eguren, in a Twitter exchange with Tierra y Libertad leader Marco Arana, tried to link the protesters with Sendero Luminoso (Shining Path), the terrorist group that, along with the government, were responsible for the deaths of 60,000 in the eighties and nineties. Eguren continued by insulting Arana, whose party has declared its support for the protesters, and accused him of being responsible for the widows and orphans left as a result of the deaths in the Tia Maria conflict . Eguren arrived at Congress with the help of the NGO Reflexión Democrática, the President of which is Roque Benavides – President also of Buenaventura, one of the companies at the heart of the Conga conflict in the Cajamarca region that had also resulted in the deaths of protesters. ?The NGO receives money from CONFIEP – the National Confederation of Business Institutions among other business entities and in turn funnels the money to help business-friendly politicians come to power . Despite the imposed militarization, the protest continues and spreads. 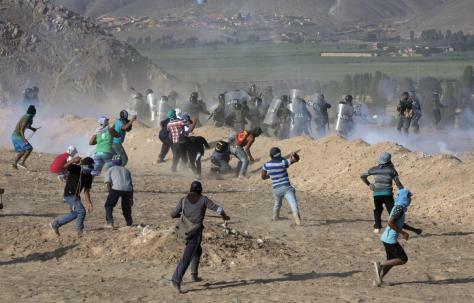 The strike reached a regional level on 12th and 13th of May, with protests taking place, businesses closing and schools suspending classes throughout the region of Arequipa. On the 27th and 28th of May a total of seven regions across the country called a 48 hour strike in solidarity with Arequipa. These included Apurímac,?Ayacucho, Cajamarca, Cusco, Moquegua, Puno and Tacna. In answer to this show of solidarity Humala militarized all seven regions, under Legislative Decree 1095, giving the Armed Forces a 60 day entry-visa into what the government sees as the main anti-mining elements opposing the country′s progress. 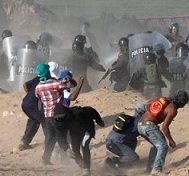 Protesters in Lima, lead by the young people who defeated the ′Ley Pulpin′ , also came out in support and were also met with violence, arbitrary detention and property destruction by the National Police . Coordinated campaigns are underway to carry out a 72 hour nationwide strike from the 7th to the 9th of June, demanding the cancellation of Tia Maria. The situation in Islay is not an isolated nor a surprising one. Instead, it reflects a worrying trend of the Peruvian state which is increasing in intensity. It starts with the over-concessioned land (the province of Islay being 85% concessioned to extractive corporations  while the Tambo Valley is 96.2% ?concessioned ), echoing other mineral-rich regions. Additionally the way in which the EIAs are passed is becoming increasingly questionable; the Humala government has passed numerous so-called ‘paquetazos,’ bundles of laws supposedly meant to reinvigorate the economy, but with the underlying intent of removing obstacles to big business. The recent anti-environment paquetazo passed in in 2014 cut the time frame for EIA approval to just 45 days  and, if the tightly-staffed MEM officials can’t complete the work within the short time-scale, they can be sanctioned. It is under these circumstances that Tia Maria’s EIA was passed, along with EIAs of many other mega projects waiting in the wings. Despite this allegiance to big business, others feel Humala has not gone far enough. The CONFIEP and the National Mining Society, along with big business leaders have branded Humala as weak, lacking firmness and consequently ‘putting investments at risk . As President Humala enters his last presidential year’, many ask whether he will further militarize and repress those who supported and voted for him to try to please those who think him weak. If the answer is yes, then further conflict is sure to come as agricultural communities across the country rise up to say ‘?No!’ to the destruction of their lands, their water and their lives. They may have lost their hope in the president, but they have not lost their hope in the future. FOCO “Informe especial sobre las operaciones de Southern Copper Corporation en el sur de Peru” Observatorio de las Empresas Transnacionales (2008). ?Available online at: http://www.inpade.org.ar/oet-documentacion%20y%20base%20de%20datos/oet-informes/Southern%20Copper%20Corporation%20en%20el%20Peru.pdf. ?Accessed 7 June, 2015. Leyva, Ana et al. “INFORME: Misión de la CNDDHH, Red Muqui?y Cooperacción. Visita in sito al valle de Tambo (Cocachacra).” Cooperacción, Red Muqui, CNDDHH (April, 2015). Available online at: http://derechoshumanos.pe/2015/05/reporte-de-visita-in-sito-a-zona-de-islay/. Accessed 7 June, 2015. Maquet, Paul E. “Tía María y la guerra?informativa.” Celendin Libre (11 ?May, 2015). Available online at:https://celendinlibre.wordpress.com/2015/05/11/tia-maria-y-la-guerra-informativa/. Accessed 7 June, 2015. /19d/main/peru-archives-76/5213-peruvian-youth-celebrates-victory-over-government-and-big-business-ley-pulpin. Accessed 7 June, 2015. Sullivan, Lynda “Peru Passes a Packet of Neoliberal Reforms, Erodes Environmental Protections and Labor Rights.” Upside Down World (25 July, 2014). Available online at: /19d/main/peru-archives-76/4956-peru-passes-a-packet-of-neoliberal-reforms-erodes-environmental-protections-and-labor-rights. Accessed 7 June, 2015. Sullivan, Lynda “Peru: Andean Self-determination Struggles against Extractive Capitalism.” Upside Down World (9 September, 2013). Available online at: /19d/main/peru-archives-76/4438-peru-andean-self-determination-struggles-against-extractive-capitalism-. Accessed 7 June, 2015.